Overview: The Karen people cluster encompasses a number of related ethnic peoples in southern and southeastern Myanmar who speak a variety of Sino-Tibetan languages. 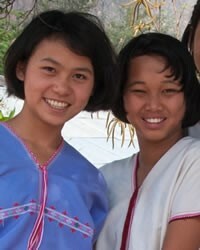 A large number of Karen also reside across the border in Thailand. A large number of Karen people are refugees due to the Karen National Union (KNU) that has waged war with the Myanmar government since 1949 in hopes of attaining an independent Karen state. Christianity, Buddhism, and ethnic religions are all practiced among these people groups.